When it comes to planning a wedding, we know there are many options to consider. Spring or fall, plated or buffet, cake or cupcakes, the list goes on and on. We hope we can help you make your wedding planning process a little more simple. Here at Maribelle Cakery, we are known for many things: using the freshest and finest, ingredients, our deliciously smooth buttercream, and our hand crafted sugar flowers. Our goal is to provide each couple with the wedding cake of their dreams. Set your budget. Having a clear budget in mind will allow you to figure out which bakeries are in your budget. Plan early! Book your wedding cake at least six months out, or earlier. Spring and fall are busy times for weddings, if you wait too long, you may find that you aren’t able to book with your first choice. Find a baker who specializes in the cake design you like. Bakeries or Home bakers. Home bakers may not have the staff to help if they are sick or they have an emergency. Also you need to make sure they are licensed in your city to sell from their home and are insured. We get calls all the time from Brides stating that their home baker cancelled last minute and they don’t know what to do. That can be an added stress no couple needs before their wedding. Sample Cake. A cake tasting not only allows you to sample cake but gives you a better idea of who will be making your cake. Be realistic, all those cake television shows don’t share all the time and work that goes into making a master piece. So understand that pricing is tied to the time and ingredients for your cake. If you want a monstrosity of a cake, the price tag will follow. Lastly, make the decision to enjoy the process all the way through until your wedding day. This is a special time, so enjoy it. Don’t stress about it. If you are feeling stressed, reach out, we are here to help. So my little girl turned 5 this month and requested that her birthday party be heart themed, which is a good fit when your birthday is close to Valentine’s Day. So we started to plan the party. My family all lives out of State so it was a very special birthday because most of my immediate family were able to attend. This was the first birthday they were able to spend with us, they all thought 5 was a good birthday to come to Cincinnati and celebrate. We had a full house and it was wonderful to see everyone. We started to design some fun Valentine themed cookies for our store and made some extras ones for our upcoming birthday party. We did a two layer cake with a small middle layer for a nicer look. We choose Cookies and Cream and our signature Orange Butter Strawberry Cream for the layers. 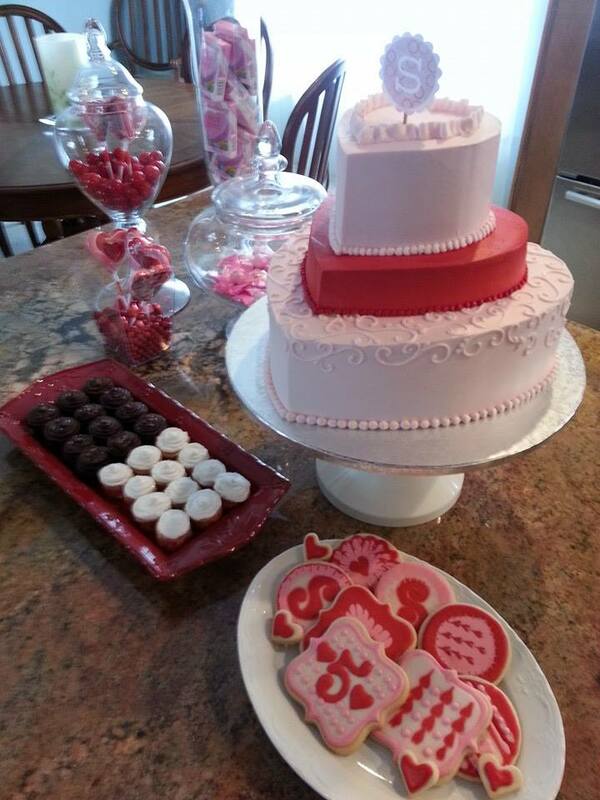 I choose pink for the cake and the small middle layer was red. We did buttercream this year, so the red middle tier was more for look, otherwise everyone’s months would have been red. Here is a picture of the cake and how we displayed it. I filled my decorative glass with red and pink candies that I purchased. We had gumballs, mints, heart suckers, sixlets and sweet heart candies. This candy ended up in the good bags for our guests. We also made mini cupcakes; dark chocolate caramel sea salt and Diva, white chocolate cake filled with our Madagascar vanilla bean. Once in a while we will have a bride that is not sure about what she would like for her wedding cake. We ask several questions to uncover her style, the look she is envisioning and consider the venue to make sure the ideas fit well. Once we establish the brides style and look of event, we then make three sketches for the bride to review. From there we review the designs with the bride listening to what she likes in our sketches, we then produce the final sketch getting the brides approval on every aspect of the design. Here is an example of the preliminary sketches. Linda Nguygen sketches 2014 Next step is our final design. I will post once completed. So don’t be worried if you have no idea what you want your wedding cake to look like, we are here to help. We have wonderful designers that can help you through the process. Items we tend to request for inspiration include the invitation, type of flowers being used, venue décor, and wedding dress. We can get inspiration from all types of things so feel free to bring things that you like, even share your hobbies with us.